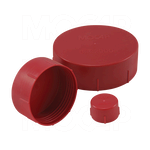 Only MOCAP manufactures multiple types of vinyl plastic dip molded, plastic injection molded and rubber caps for all of your product protection, masking or finishing requirements. From injection molded low density polyethylene (LDPE) plastic caps to vinyl dip molded caps, end caps and high temperature vinyl caps, to silicone and EPDM rubber caps. MOCAP has the low cost, quality products to satisfy your product protection requirements. Use a MOCAP cap to protect your product during assembly, conversion, or shipping. Apply a MOCAP cap to provide a finishing touch to your product. Use a MOCAP cap for low cost masking or protection from debris. 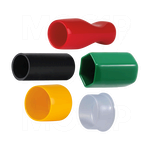 MOCAP also offers hundreds of sizes, shapes and designs low density polyethylene (LDPE) plastic caps and plugs. All are stocked and ready to ship. The vinyl dip molding process produces custom flexible PVC Caps and allows you to specify length, wall thickness, color, surface texture and hardness with no additional tooling charges. Many sizes stocked and ready to ship. 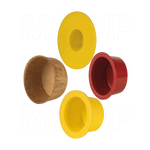 MOCAP offers a wide range of EPDM Rubber Caps and Silicone Rubber Caps for paint, powder coat and spray masking applications. Many sizes stocked and ready to ship.